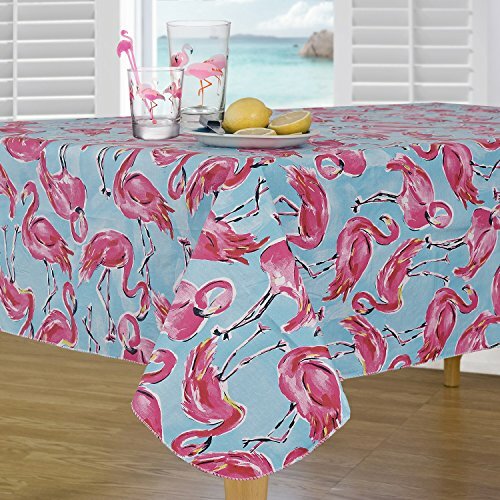 Add a fun and whimsical touch to your next dining experience with this tablecloth from the Everyday Luxuries by Newbridge Flamingo Flannel Backed Indoor Outdoor Vinyl Table Linens Collection. This pattern features bold pink flamingos on a turquoise background that will quickly liven up your table setting. The tablecloth is 52 x 70 oblong (rectangle) and seats 4-6. It is 2.8 gauge with quality flannel backing for extra durability, weight and slip resistance to help keep the tablecloth in place. The vinyl surface makes clean up a snap and keeps your table protected from everyday spills and accidents. Perfect for indoor and outdoor dining. Great for picnics, gatherings, parties, occasions and everyday meals. For best results, use a mild soap solution with a damp cloth or sponge on vinyl surface. Do not iron. PERFECT FOR: Indoor and outdoor dining. Lovely and versatile for entertaining, picnics, birthdays, dinner, BBQs, special occasions, everyday meals and more! CARE: For best results use mild soap solution with damp cloth or sponge on vinyl surface of tablecloth. Do not iron. SPECS: The tablecloth features 2.8 gauge vinyl with quality flannel backing for extra durability, weight, and slip resistance. It is 52 x 70 oblong (rectangle) (132 x 178 cm), seats 4-6 and fits tables from 28 in x 46 in to 40 in x 58 in. If you have any questions about this product by Everyday Luxuries by Newbridge, contact us by completing and submitting the form below. If you are looking for a specif part number, please include it with your message.